Every semester, DramaTech works to put out several plays and improv shows, the most recent installment being the play “Sweeney Todd: The Demon Barber of Fleet Street.” For those who have not seen the Johnny Depp movie adaptation of the musical, Sweeney Todd is a psychopathic, revenge-driven barber who’s intent on killing the men — the extremely powerful men — who ruined his life and took his family away from him. He is aided by the woman who owns the pie shop below his barber shop. This woman, Mrs. Lovett, who, quite honestly, is really a psychopath in her own right, takes the bodies of the people Sweeney Todd kills — since he doesn’t limit his homicides solely to his real targets—and turns them into meat pies, effectively reviving her failing shop. As morbid and bloody as the play is, it is a tasteful kind of morbid and bloody, especially the way DramaTech has produced it. The stage itself is surrounded on three sides by the audience, who are no more than a yard away from it, and only has the center-most section raised. Running the perimeter of the main stage area is a gutter, in which vibrant red “blood” flows whenever Sweeney Todd kills and pours a bucket full of this “blood” down the drain on the raised part of the stage, a beautifully morbid visual aid for the audience. One of the best features of Todd’s murderous rampage is the reclining chair he replaces his stool with in between the two acts, which he can recline back and force the dead bodies down what resembles a laundry chute into the baking room. The sheer amount of death in the play brings to mind the lyrics of a song from a completely different musical, “Repo! The Genetic Opera,” “bloodbath … it’s gonna be a bloodbath… .” And blood bath it is, especially by the end. Because the stage is not completely raised and is surrounded by the audience, actors are able run on and off stage from all directions with little difficulty, often appearing in different corners from where they had exited. In addition to this amazing amount of movement, the actors also pull the audience into the tale by occasionally walking up and addressing members of the audience, whose responses are not actually required, or walking up the stairs where the audience resides and singing. 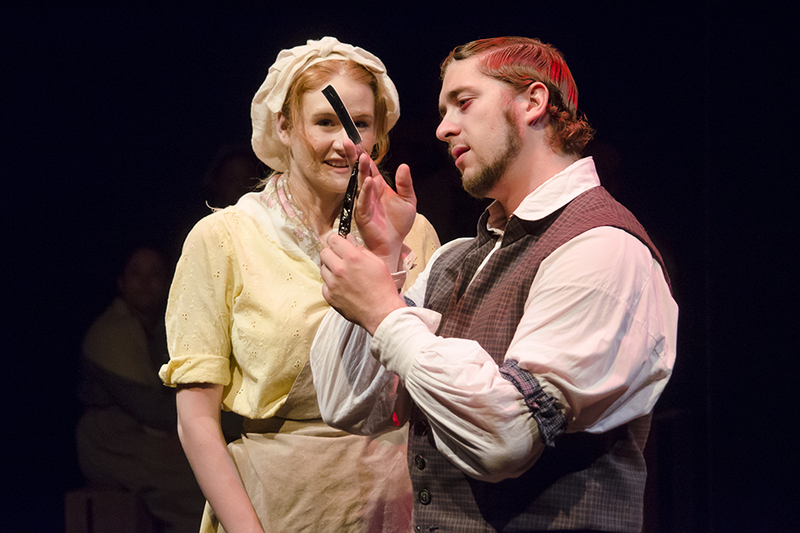 This effectively breaks the invisible wall between the audience and the actors, essentially bringing the audience onto the stage itself and into the bloody world of Sweeney Todd. While this method of delivery can sometimes be poorly executed, it is, in this case, a perfect way to instill the intended feelings of mild fear and morbid fascination in the audience, as well as draw them further into the bloody tale. On top of the clever set design and interactive aspect of this play, the company as a whole is comprised of actors with extremely strong and beautiful vocals, especially the actors who play Mrs. Lovett, Sweeney Todd and the Beggar Woman, as well as amazing acting skills. Whenever the company as a whole sings together for continuation of “The Ballad of Sweeney Todd,” they are able to instill an eerie sense of an inevitable tragedy in the audience with the tone of their voices and harmonization. However, despite their strong voices, it is sometimes difficult to make out what they are singing—an unfortunate outcome of singing on stage without a mic of some sort while loud music plays in the background. On top of that, it is occasionally difficult to see exactly what the actors are doing on stage if one is not seating in the set of bleachers directly in front of the stage. Additionally, the end leaves an unfortunate lingering question of what happened to Johanna and Anthony. However, these mild drawbacks do not actually detract from the execution of the play as a whole. Lastly, it is highly recommended to stay seated through intermission, as the antics of the company during this time are sure to bring a smile to anyone’s face.